There were many changes in the contest when Benedictine Geethika Jayatileka who led the Platinum segment for Division One schools last week was pushed down to second place by Royalist Milan Abeysekera who polled in 3,742 votes in the third week’s counting at the Sunday Observer/Mobitel Most popular Schoolboy Cricketer competition. Peterite Julien de Silva who was placed third last week was placed at number four with Sebastianite Anusha Perera taking the fourth slot with 2,641 voters. Like wise Thurstan’s Minhad Jaleel with 1,301 votes went up one step in the ladder to occupy the seventh position after being number eight last week. 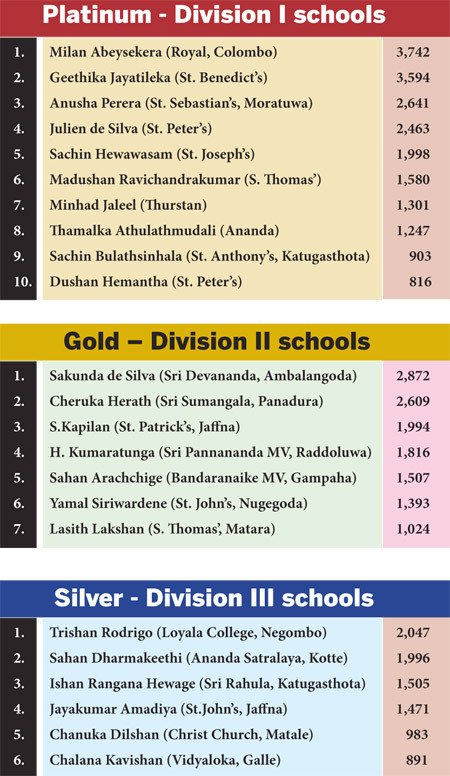 In the Silver for schools playing in Division Three, Trishan Rodrigo of Loyala College by voting 2,047 votes took over the first place from Ananda Sastralaya, Kotte’s Sahan Dharmakeerthie (1996).